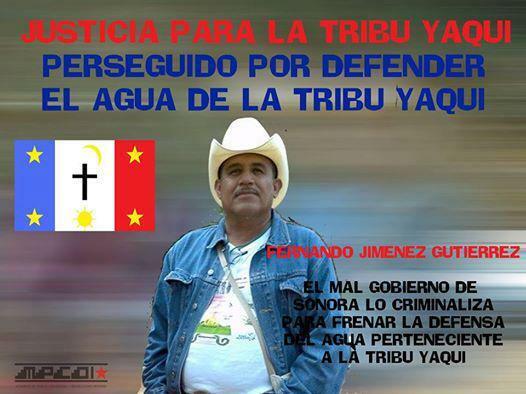 After learning about a new court decision in favour of Fernando Jiménez Gutiérrez, leader of the Yaqui tribe imprisoned since September 2014 for opposing construction of the Independence Aqueduct in the state of Sonora, several human rights and civil society organizations demanded that the Mexican State refrain from carrying out other delaying tactics and order his immediate release. The day before, the Second Appellate Court for Criminal and Administrative Matters in Sonora rejected the appeal lodged by the Public Ministry against the indirect amparo won by Jiménez Gutiérrez, in which the Second District Court ordered the Judge to release the leader. Fernando Jiménez, human rights activist and spiritual leader of the Yaqui tribe, and Mario Luna, who at that time was spokesman and traditional authority of the village of Vícam, are currently imprisoned. Jiménez was arrested on September 23, 2014, and Luna was arrested on September 11, 2014, by the Sonora state government, which charged both men with illegal deprivation of liberty and robbery—crimes they did not commit.